Incredible quality and priced far below value to the high end custom finishes throughout. We welcome you to paradise in Flint Hills National! Have you been looking for a special one of a kind custom built home on a lake lot with unique features and high end upgrades? Look no more! This home spells spectacular! The moment you enter the solid double door entry into the foyer you will know you have never seen another home with these finishes or this layout. The foyer is both welcoming and stunning with one of a kind imported roof tile flooring from France, specialty paint and unique lighting. Enter into the vaulted great room that features a floor to ceiling stone fireplace, beamed and wood covered ceiling, hand scraped style hardwood floors with a wall of windows that flood in light. The French doors lead out of the great room into the covered and screened veranda giving you both swimming pool and treed private lake views. The kitchen is both gourmet and very comfortable for entertaining with 2 islands, upgraded appliances included gas range, double ovens, 2 built in refrigerator's, 2 dishwashers and a private butler's pantry that is a one of kind must see. The cabinets have designer furniture finishes and are top of the line in quality. The formal dining room is generous in size and features a one of kind specialty ceiling, crystal & iron chandelier, antique fireplace mantel and the flooring is also stone roof tiles imported from France, a wall of windows with beautiful views make this dining room simply one of a kind for everyday life, entertaining and building special memories. The Master Suite features his and her bathrooms, a steam shower, whirlpool tub, heated floors on her side and separate spacious closets with built ins. The laundry room is in the master suite area. There is a 2nd bedroom upstairs that is very private and the size of a small apartment with a separate sleeping and living area with a full bath. The lower level is a 10! with a walkout to pool area, a full kitchen bar, wine cellar, spacious rec room, exercise room and 2 additional bedrooms and baths. There is also a second laundry room off of the pool bathroom that leads directly outside eliminating the need for a pool house. This house was solidly a constructed with insulated concrete exterior walls and an air exchange. There is specialty paint and murals throughout this home. The backyard is a resort! It is fully fenced and professionally landscaped with an east facing backyard which is perfect for the pool and entertaining in Kansas summers. The screened in veranda is over-sized & vaulted with a stunning wood finished ceiling, speakers, outdoor fireplace, salt water pool and a beautiful waterfall feature. 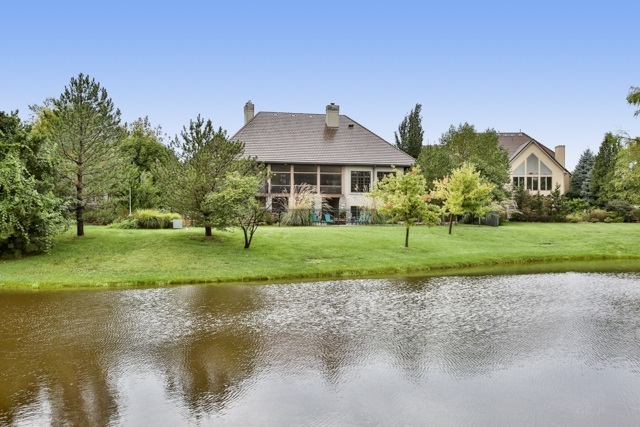 Beyond the treed lake views there is easy access to the golf course but the privacy is complete for this property. Hurry, this one is priced to sell! Call today for a private appointment. Andover Schools. Gated Community. HOA dues include lawn mowing, snow removal, security gate & general upkeep for commons. Membership required for Golf.